This study explores the opportunities that the dynamic between the cross-fertilization of architecture and fashion approaches may offer. 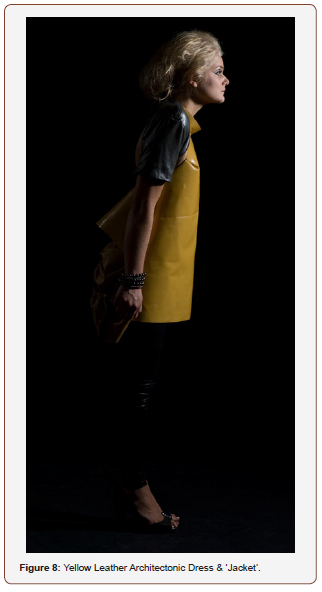 The research is substantiated via the production of threedimensional leather garments which initiate key synthesis of materials, techniques and processes and interrogates fabric, form and function, to evaluate whether there is prospect for re-alignment, new methodologies and practices within a fashion context. Since the 1980s, a growing number of avant-garde fashion designers have approached garments as architectonic constructions, while architecture has boldly embraced new forms and materials – thanks to numerous technological advancements that have revolutionised both the design and construction of buildings and made techniques like pleating, stitching, folding, and draping part of the architectural vocabulary. Garments of increasing conceptual sophistication and structural complexity can be seen on runways and in the streets, just as buildings of unparalleled fluidity and innovation have come to grace major urban centers around the world. In both fashion and architecture, the early 1980s were marked by significant design events and advances that have contributed to cultural shifts in each field. Japanese fashion designers Kawakubo and Yohji Yamamoto first presented their work during the Paris ready-to-wear collection shows in April 1981 (Figures 1A&1B). The oversized often asymmetrical black clothing they showed featured intentional holes, tatters, and unfinished edges that stood in stark contrast to the elegantly decorative, crisply tailored, and formfitting looks being shown by the majority of designers and, as a result, challenged accepted ideas of fashion, femininity, and beauty. 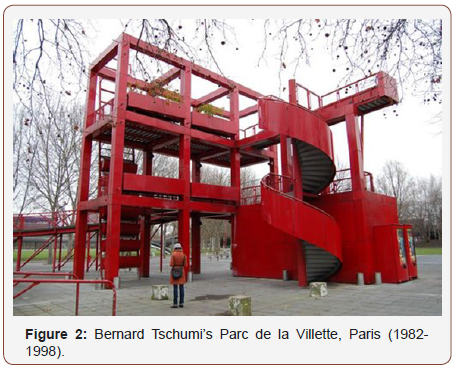 The following year, architect Bernard Tschumi won the international competition to design Parc de la Villette in Paris (Figure 2) [1,2]. His project, and the resulting collaboration between architect Peter Eisenman and philosophers Jaques Derrida, served to introduce ideas of deconstruction to a much larger audience. For designers in both fields, the early 1980s were characterised by a struggle for liberation from convention that involved experimentation with new forms and an openness to ideas and techniques from other disciplines to inspire radically different approaches to design. 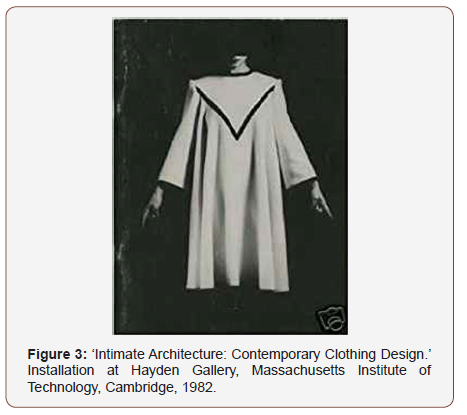 A critical event with reverberations for both fashion and architecture occurred in 1982, when Susan Sidlauskas organized an exhibition for the Massachusetts Institute of Technology’s Hayden Gallery (now List Visual Arts Centre) called ‘Intimate Architecture: Contemporary Clothing Design’ (Figure 3), which examined the formal aspects of the work of eight fashion designers from an architectural point of view. 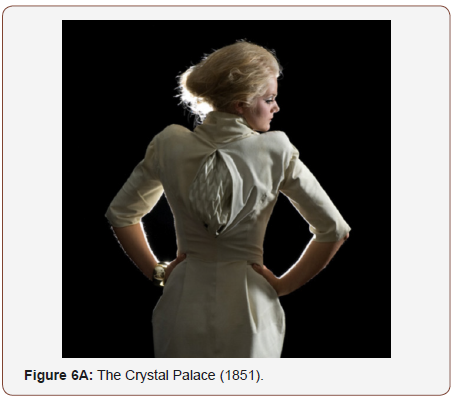 Sidlauskas’s influential exhibition was the first public presentation to illuminate and analyze the architectural aspects of contemporary clothing design to make a formal connection between the two practices. While Sidlauskas’s exhibition made it clear that fashion designers were conversant with architectural forms and principles and, indeed, with the work of particular architects, it is only recently that a true crossfertilization has developed, as architects have in turn begun to pay closer attention to fashion design. This is largely due to two advancements that have taken place during the last twenty or so years. First, the practice of major fashion houses commissioning  well-known architectural firms to design their retail spaces has demanded that the architects carefully study the work of their clients. Second, the development of computer software has encouraged the two disciplines to look to each other for inspiration and methodologies. Developments, application, cross-fertilization and new technological advancements underpin leather garments available at any time in fashion history; contemporary or historical. Just as architecture and fashion, leather, man’s earliest clothing material, served too, to protect and shelter, and has come to occupy a unique role in the history of fashion. The most extreme images are associated with leather, from the animal hides that cave dwellers wrapped themselves in, to haute couture dresses as finely cut as gemstones. Whether sophisticated or crudely fashioned, fragile as gossamer or indestructible and synonymous with power, leather shows up in every kind of wardrobe, in every kind of climate [4- 7]. The connection between clothing and shelter dates as far back as the Ice Age, when people used animal skins to cover themselves and to fashion exterior walls for rudimentary structures. In ancient Greece, the flutes of columns were echoed in the drapery folds and cylindrical form of the chiton – the iconic woolen tunic made from a single length of fabric draped over the bodies of both men and women. Both classical Greek dress and architecture were conceived in harmony with the proportions of the human figure . Historically, as the use of leather became more sophisticated, deeper and more complex parallels have developed between fashion and architecture, as a result of new industrial technologies and manufacturing processes. In the 1850s, prefabrication of building materials and advancements in steel construction resulted in light, open architectural spaces, as fewer structural elements were required to engineer buildings. 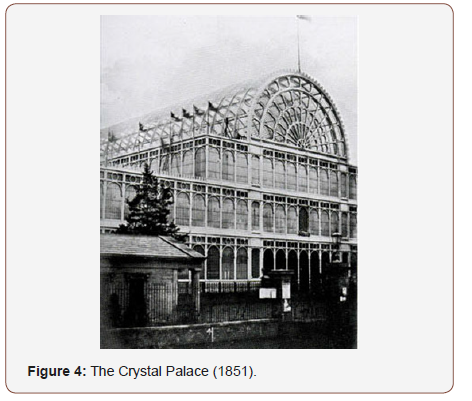 The Crystal Palace (Figure 4), an open web of cast iron girders covered with glass designed by Joseph Paxton for the Great Exhibition of 1851 in London, had one of the most open and expansive building interiors of its time. A similar approach to construction was applied to women’s wear: as a practical solution for heavy layers of petticoats or crinolines, designers developed armatures of metal hoops to support the wide dome-shaped skirts of the 1850s. Notably, this period also marks the emergence of the sewing machine as we know it today, making precise forms and mass production possible in the garment industry. The sensuous, organic curvilinear shapes made popular by Art Nouveau in the late nineteenth century could be seen in fashion at the time in the work of Paul Poiret, among  others. In the work of this period, simplicity of form and fluid ornamentation were paramount, and shapes derived from nature were critical sources of inspiration. Later, in keeping with the emerging ideals of modernism, both fashion and architecture moved toward greater simplicity during early to mid-twentieth century as ornament was stripped away, forms were pared down, and structure began to be exposed. That fashion and architecture have a great deal in common may be surprising, their scales of production are wildly different: fashion designers create garments for the human body, while architects create buildings large enough for many bodies to inhabit simultaneously. While the fashion designer and architect create objects that differ in size and materials, their creative processes can be strikingly similar. Both begin with a flat two-dimensional medium, transforming it to create complex three-dimensional forms. The same prevailing aesthetic tendencies, ideological and theoretical foundations, and technological innovations have influenced each, resulting in garments and buildings that share stylistic or structural qualities or derive from common creative impulses. And, over time, designers in both fields have drawn from each other for inspiration as well as certain technical strategies. 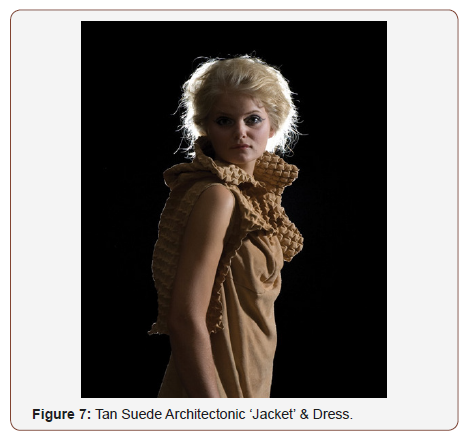 Vocabulary derived from architecture has been applied to garments (“architectonic,” “constructed,” “structural,” etc.). And architects have borrowed and adapted sartorial strategies and vocabulary from the fashion world (“draping,” “wrapping,” “weaving,” “folding,” “printing,” “pleating,”). The point of origin for both practices is the body. Both protect and shelter, while providing a means to express identity – whether personal, political, religious, or cultural. 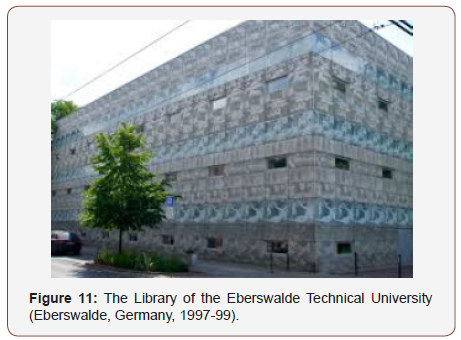 If the earliest examples of cladding for the human body were not “designed” but rather devised out of necessity, contemporary practitioners in both fields have continued to address the human imperative for shelter in ingenious ways. Teng has developed a series of collections based on ideas of nomadism, designing cloaks and other garments especially suited for travel. Dutch designers Viktor & Rolf addressed the idea of shelter in a more conceptual way with their seminal Russian Doll haute couture collection of autumn/winter 1999-2000 (Figure 5). This collection comprises nine garments that, during the runway show, are gradually layered on the body of a model standing on a revolving platform. Beginning with a simple unornamented dress woven from coarse fibers, the designers layered the additional garments so that by the end of the show the model was enclosed – almost hidden – inside a dense volume, similar to the way the smallest Russian doll is nested in her bigger sisters’ bodies. Unlike any other material, leather is intrinsic to the fundamental factors that bind fashion and architecture; protection and shelter. None of the various synthetic materials of the latter half of the twentieth century has managed to usurp leather’s prominent place within fashion. Its role has gradually shifted from a protective to a seductive one, encouraged by highly sophisticated techniques that now give it the kind of softness found in the finest fabrics. From its humble necessary beginnings, leather fashion garments are now a sign of luxury. The grain, the smell, the touch and the richness are synonymous with quality. Its versatility also makes leather one of the paramount materials to work with . Method: Designing leather garments requires working twodimensionally from flat drawings as well as three-dimensionally on the mannequin. Both fashion designers and architects traditionally begin by taking an idea and, working out its practical requirements, translating it into a three-dimensional structure using flat materials. In both disciplines it is common to explore initial ideas about form and materials by sketching. From early sketches, study models are made, since it imperative to study the evolving designs in a form that more closely resembles that of the finished product. In the case of fashion, mock-ups of a garment are made of calico and are often fitted and draped directly on a dressmaker’s form or a fit model. Some architects and fashion designers use a responsive or intuitive process to translate their ideas into three-dimensional models and patterns. For example, both Gehry and Kawakubo have used materials at hand – a rumpled pillowcase, a crinkled paper bag, a crumpled piece of velvet – to assist in communicating their concepts to colleagues who then work out the often-complex technical issues required to actualize the design. The types of notations or instructions found in a standard set of architectural drawings – plan, section, and elevation, as well as drawings of details – are also found in a dressmaker’s pattern. 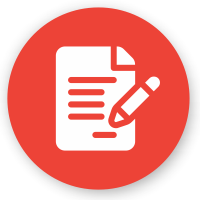 Graphic devices indicate the placement of seams, darts, and fastenings as well as the shapes of the various components that are cut and assembled into a finished garment. Architects develop floor plans to show the disposition of a building’s rooms, the location of walls, doors, and windows, as well as the placement of plumbing fixtures and sometimes even furniture. Computer software is used in both fashion and architecture to generate patterns and plans, which benefit from greater precision and more instant revision than can be achieved via freehand methods. As architects have moved away from freehand drawing and model making toward increasingly sophisticated design software to generate more complex architectural forms, they have looked to fashion for inspiration – in particular, its methods of construction and its manipulation of flat, two-dimensional cloth. Indeed, fashion has a long history of dealing with the kinds of complex forms and constructions that architects are now able to confront thanks to advancements in software and building materials. Each piece within the Architectonic collection is unique. Created to test, develop and combine key fashion and architectural principles from geometry to suspension, to folding and pleating. The cream dress (Figures 6A & 6B) features a folded back panel covering a complex pleating section which is exposed only when the body moves. The pleated tan ‘jacket’ (Figure 7) worn unaffected as a skin, uncut from the original hide with only slashes as armholes to reveal it can be worn. Pleats and folds are key to the Architectonic garment collection as these are the tectonic strategies shared most frequently by fashion and architecture. Pleating is a subset of folding, in which regularly spaced folds or creases occur at close intervals. By folding one flat piece of material it becomes a volumetric form with three-dimension. This is central to achieving the silhouettes of the yellow and grey Architectonic dresses (Figures 8 & 9). Since the early 1990s, folding has been used by architects as a device to create greater visual interest through dramatic effects of light and shadow on a building’s exterior and to manipulate the volumetric forms of the interior. Within the Architectonic collection, this has been translated by adding various coatings to the surface of leather; patent, plush suede and print finishes have been employed to mimic the effects of light and shadow on architectural structures and relay this to the body. Eisenman’s unbuilt projects for Rebstockpark in Frankfurt, Germany (1990-91), and the Emory Centre for the performing Arts in Atlanta (1991) are remarkable early explorations into the development of folded architectural skins. Just as in his ground breaking ‘Pleats Please’ Issey Miyake line, the Japanese designer was able to introduce new textures and sculptural volumes thanks to his pioneering work with pleating techniques . Traditionally, flat fabric is pressed and pleated before being sewn, but Miyake reversed this process, creating oversized garments that shrink after pleats are applied. The sculptural forms of these pleated garments have inspired a number of architects, including Gehry . The idea of incorporating surface pattern, coatings and printed textiles into clothing designs is not new, but in architecture, applying a pattern to a building’s façade is often redundant since repeating surface patterns and textures are created by functional and structural elements such as fenestration, apertures, posts and beams, etc. 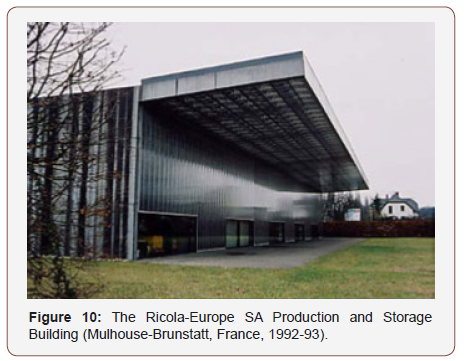 In the printed skins of two buildings – the Ricola- Europe SA Production and Storage Building (Figure 10) [13,14] and the Library of the Eberswalde Technical University (Figure 11) - Herzog & de Meuron seem to have taken their cue directly from textiles and fashion. The images come from photographs selected by artist Thomas Ruff from magazines he has collected over the years. The source of the printed images not only alludes to the building’s function as a library but also serves to unify the entire structure by diminishing the material differences between glass and concrete [3,15]. The patterns printed onto the Architectonic grey leather cocoon dress (Figure 9)  are inspired by the flat two-dimensional starting point of (pattern cutting) paper. The paper was used in the development of the garment into threedimensions and as a result has become creased, folded, indented. These affectations were then photographed and turned into screens for printing. A tonal dye finish was elected to denote a subtle surface change, as like the paper in this instance, it is only the worn shadows, that morph the paper from two to three dimension. In 2004, a major section of ‘Metamorph,’ the vast international exhibition organized by Kurt W. Forster for the Venice Architecture Biennale, explored the properties of building ‘skins,’ which can be defined as the continuous exterior surface that covers the structural framework, or ‘bones,’ of a building. Toyo Ito’s Tod’s Omotesando Building in Tokyo (2002-04) (Figure 12a), features a surface made of glass and crisscrossed load-bearing concrete beams that appears at once to be light and strong, a marriage of skin and bones that creates a pattern that references the trees that face the building’s site. 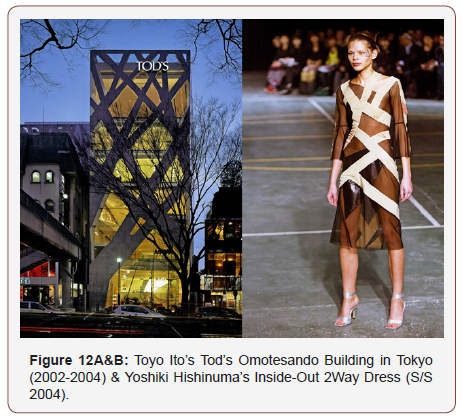 This architecture can be likened to Yoshiki Hishinuma’s Inside-Out 2Way Dress (S/S 2004) (Figure 12b). 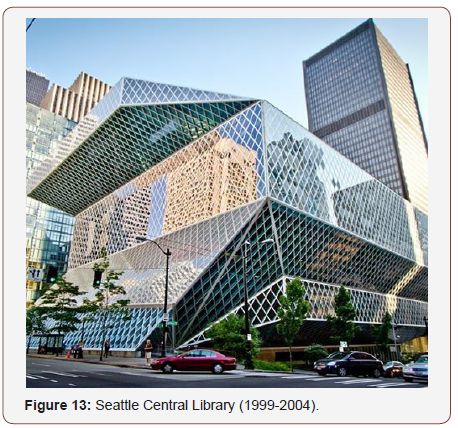 In their Seattle Central Library (Figure 13), Koolhaas and Joshua Prince-Ramus of OMA stretched a diamond-patterned structural mesh skin over the cantilevered and vertical volumes of the building, much like a fishnet stocking stretched over a leg. In fashion, the garment itself serves as a metaphorical skin, but the products of the innovative computer-programmed industrial knitting machine developed by Miyake, draw a direct parallel to the structural skins being developed for contemporary architecture. With A-POC (A Piece of Cloth) technology, a whole garment is cut from a woven or knitted tubular piece of fabric rather than assembled from many pieces sewn together. The principles of geometry and suspension were used to underpin the silhouettes for the Architectonic yellow and grey dresses (Figures 8 & 9). Geometry has long been employed to generate form in architecture. Preston Scott Cohen’s work with descriptive and projective geometry in his early drawings has resulted in intricate and complex work as he has explored ways to use unusual forms such as the torus to create extraordinary spatial effects. Eisenman and OMA/Koolhaas have experimented with the convoluted twist and continuous form of the Mobius strip to generate buildings. 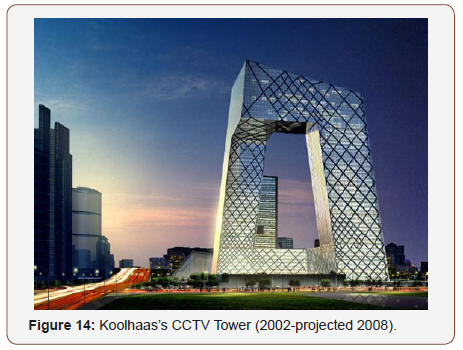 Eisenman’s Max Reinhardt Haus (unbuilt, 1992- 93) and Koolhaas’s CCTV Tower (2002-projected 2008) (Figure 14), in Beijing are examples of the employment of the Mobius strip in tall vertical buildings. 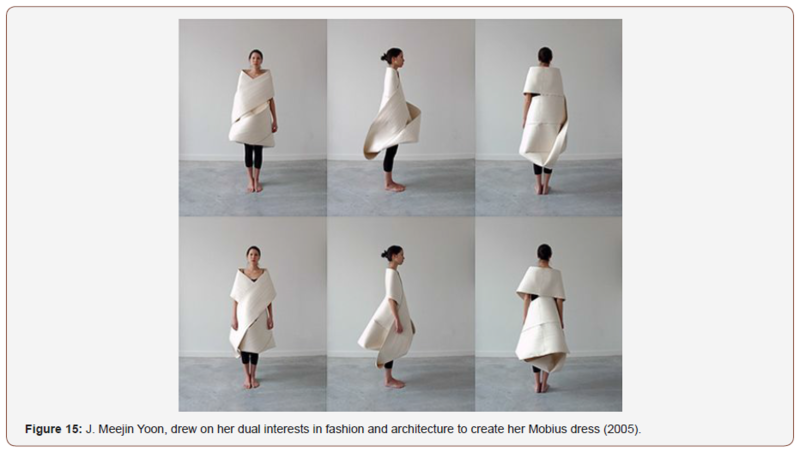 Like Manferdini, architect J. Meejin Yoon drew on her dual interests in fashion and architecture to create her Mobius dress (Figure 15) , in which a large Mobius strip is looped over and around the body to create a tent-shaped garment. 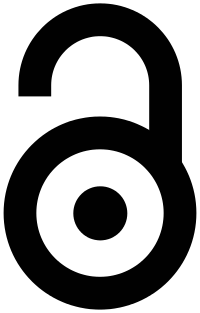 In Architectonic the exaggerated oval silhouette of the grey dress (Figure 9) was drawn from geometry. Forming a hyperbolic curve through the center back harvesting a distortion unfamiliar to most fashion silhouettes. Secured by a central fold, the structure undulates, bows and crooks, with the body’s movements. Just as contemporary architectural structures are often permitted to sway, bridges and walkways to bounce and be flexible. Architecture increasingly requests human interaction play a greater involvement in the usage of structures to achieve its principal effect. In fashion design, rigid geometrical forms appear less often, since conventional garments are made of multiple pieces of fabric that are cut and assembled to compliment and conform to the shape of the body. However, explorations of geometry have appeared frequently in the practices of both Teng and Isabel Toledo. Teng who has always been interested in making the most efficient and economical use of a length of fabric, has created garments made up of precise geometric forms that can be reassembled like puzzle pieces back into the original piece of cloth. When these garments are worn, however, their geometry is invisible; each takes on a completely different shape due to gravity, which causes it to hang or drape, and the body, which fills out its form. Toledo is also inspired by geometry, but of a more organic, less rational variety. She takes a reductive approach to pattern-making-what she calls “romantic mathematics”- by paring each garment down to its simplest geometric form (cylinder, cone etc.). On the body, her clothes undergo a transformation as well, as pieces cut from squares, circles, and triangles lose their flatness and become delicate, flowing organic shapes. Toledo has studied the properties of different fabrics and how they perform on the body, calling the results ‘liquid architecture.’ This describes “the way fabrics of different weights (in particular, matte jersey) cascade into folds, skim the body, and fall like water to the ground” (Toledo, 2006). 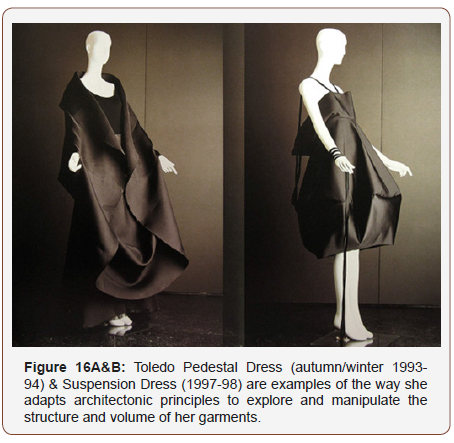 Her Pedestal Dress (autumn/winter 1993-94) (Figure 16a) and Suspension Dresses (1997-98) (Figure 16b), are examples of the way she adapts architectonic principles to explore and manipulate the structure and volume of her garments. In addition to Toledo’s work, garments incorporating the principle of suspension have also appeared in the collections of fashion designers as varied as Ralph Rucci, Junya Watanabe, and, Teng. Rucci’s suspension garments, such as the black woolcrepe dress from his spring/summer 2005  haute couture collection, are less about gravity than they are about the complex engineering that goes into the composition and finishing of a garment, some of which comprise more than eighty-five pattern pieces. ‘Suspension’ refers to the way the pieces of fabric seem to hang in the final garment, held together by almost discernible layers of hand-stitching. Watanabe’s spring/summer 2003 Objet collection (Figure 17), featured floral-printed and white dresses whose delicacy belies the fact that they are made up of a sturdy, rather stiff nylon fabric that can be ruched by either tightening or lengthening a series of nylon webbing straps deployed in various locations on the garment, similar to the way the shape of an open parachute can be manipulated by its straps. 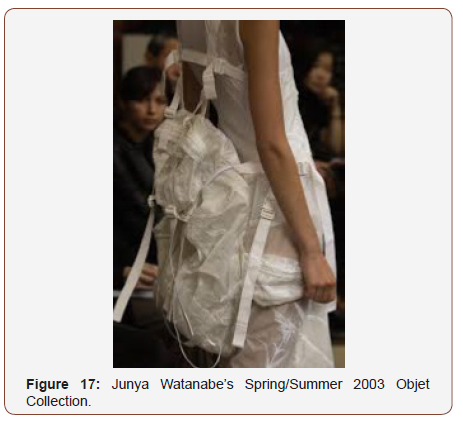 In her spring/summer 2006 collection [19-20], Teng presented several different dresses with cables that hoist fabric in a way that recalls the engineering of suspension bridges (Hodge, 1999, P.18). The yellow Architectonic piece (Figure 8) examines these principles. Suspension is used to achieve the form, the back ‘skirt’ appears to be independent of the more conventional halter neck, rather, it is integral to the onepiece silhouette. The Architectonic grey padded shoulder ‘armour’ (Figure 8) represents the drama of the many souring architectural structures which seem mysterious in their ability to stay upright. Which distort the skylines and change the landscape, just as the Architectonic fashion pieces play, divert, twist and interfere not conforming to usual fashion ideas and ideals. Architectonic is a total fusion of materials, techniques and processes, architecture, body and clothing. Leather is used to define the cross disciplinary nature of the fields as well as adding the specific texture, surface and finishes aligned to the notions of protection and shelter. Blending function, materials and themes, intensifying familiarity of touch, sense and body by using a ‘second skin’. The chameleon-like material, half protection, half ornamentation, is a bastion against uniforms and the standardization of appearances. As with fashion and architecture, whether consciously or subconsciously, leather affects us indelibly with its singular texture and feel. A living mould, sculpted by the body’s habits which leave their mark in the memory of its folds and scratches. As an identity revealing second skin that defies the seasons and stays with its owner for years (until it is handed-down to the next generation), as with fashion and architecture, leather acts as a witness to every age and era - and as we know ages and eras are made up of dramatic advances and equally spectacular retreats. Just as leather is chameleon-like, Architectonic is to: half animal, half architectural. Architectonic is a hybrid experiment, which has established that the field of inter-disciplinary research is rich and rewarding. One that creates prospect for re-alignment, new methodologies and practices within a fashion context. The cross-fertilization of materials, techniques and processes between fashion and architecture are present and constructive. Across discipline, key production processes such as pleating, folding, geometry and suspension, are both functional and beautiful. Familiar and safe, but equally open up inspiration, creativity and innovation potential. 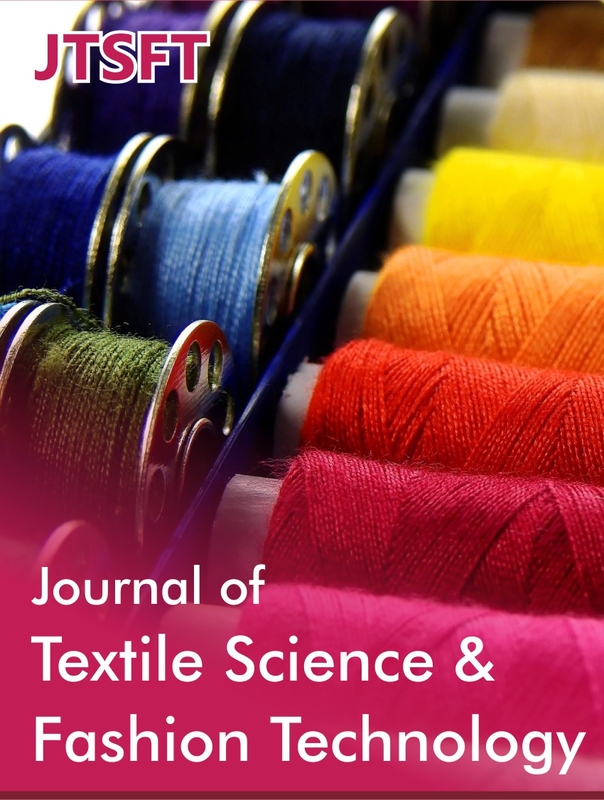 What this research also highlights are how the garment production techniques highlighted and adopted within the study align to ethical issues, sustainability, and recycling. Through using one piece of cloth, ‘found’ objects and/or geometry via zero cutting, subtraction cutting and TR cutting techniques, many concerns prevalent within the fashion industry are addressed. Other future developments this study draws attention to include the potentiality of cross-fertilizing materials, techniques and processes within and across other disciplines. But also, from a material perspective, the technological and scientific advancements occurring within the production of leather and non-leather are key considerations for future research. New ‘leathers’ can be grown from fungi, fruit and cells. Creating vegan and victimless versions has been realized. More stringent regulations of exotic leathers require innovation within the generation of materials which mimic the original. Has the culture of producing ones’ own versions of exotic leather, unique finishes, branding etc. led to the rise of value, longevity, originality and customization within leather goods? If so, what does this mean for fashion? Seeling C (1998) Fashion the century of the designers 1900-1999, The fashion book, Phaidon. London. Steele V (2016) Fashion Designers A-Z, Taschen, London. Hodge B, Mears P, Sidlauskas S (2006) Parallel practices in fashion and architecture, Thames & Hudson, London, p.57. Quilleriet A L (2004) The Leather Book, Assouline Publishing, New York. Almond K (2010) Insufficient allure: the luxurious art and cost of creative pattern cutting. 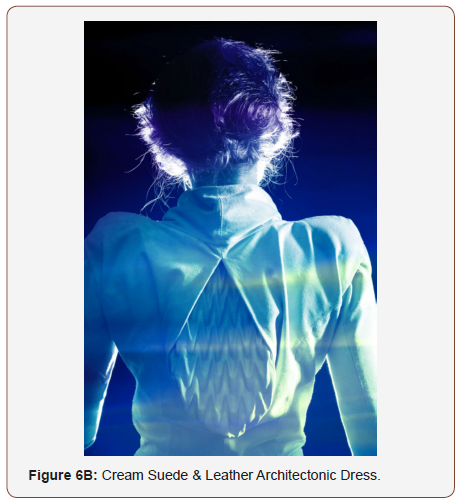 International Journal of Fashion Design, Technology and Education 3(20): 15-24. Celant G (1997) To cut is to think. Art/Fashion, Guggenheim Museum, New York, USA, pp. 22-27. Johnson I, Cohen AC, Sarkar AK (2016) Fabric Science (11th edn) pp. 69- 75. Allyne L (2016) Something about leather, Wentworth Press. New South Wales, Australia. Sterlacci F (2010) Leather Fashion Design, Laurence King, London. Miyake I (2012) Pleats please. Taschen, Germany. Newman TR (1973) Leather as art and craft: Traditional methods and modern designs, Crown, USA. Piazza A, Schiavi A (2016) Fashion 150: 150 years/150 Designers, Laurence King, London. Santlofer D (2012) 50 contemporary designers you should know (50’s Series), Prestel. London. Koda H (2007) Extreme beauty: The body transformed, Metropolitan Museum of Art, New York, p.168. Schwebke PW, Krohn MB (1970) How to sew leather, suede, fur, Simon and Schuster, The Bruce Publishing Company, USA. Braddock Clarke SE, O’Mahoney M (2005) Techno textiles 2: Revolutionary fabrics for fashion and design, (2nd edn), Thames & Hudson, London, p.208. Lee S (2005) Fashioning the Future, Tomorrows Wardrobe, Thames & Hudson. London. De Cruz E (2006) Fashioning fabrics: Contemporary textiles in fashion, Black Dog Publishing, London. Fukai A, English B (2006) The Cutting Edge: Fashion from Japan, Powerhouse Publishing. Sydney, Australia. 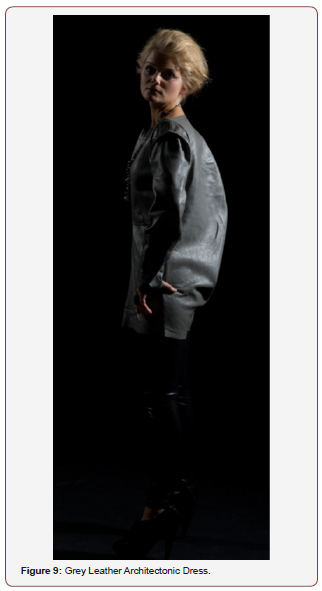 Leather, Fashion, Architecture, Multi-Disciplinary, Cross-fertilization, Materials, Techniques, Processes, Fabric, Re-alignment, Pleating, Stitching, Folding, Draping, Garments, Innovation, Decorative, Crisply tailored, Femininity, Beauty.